Amazon looks for a healthy competition with Apple iPad Tablets. 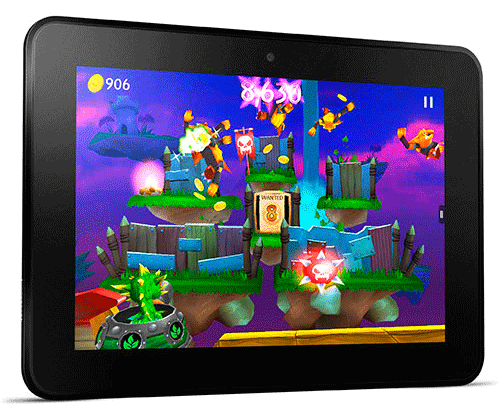 Now Amazon launched 8.9 inch Kindle Fire HD Android tablet with 1920 x 1200 pixels HD display. The display screen is featuring polarizing filter and anti-glare technology for the stunning visual experience with high profile protection. 254 ppi (Pixels per Inch) display density provides a decent visual clarity even in day light. The tablet sports a Dolby audio system with dual-driver stereo speakers which enable virtual surround sound. Amazon Kindle Fire HD tablet is powered by a 1.5 GHz dual-core TI OMAP4470 processor with inbuilt SGX544 3D graphics acceleration. The Company climes that the Kindle Fire HD is the first dual-band, dual-antenna Wi-Fi connectivity tablet in the world. 32 GB (27.1 GB user accessible) or 64 GB (55.7GB user accessible) internal storage variants are available in the market. 4G LTE 10 band advanced connectivity is the main attraction of the tablet. Amazon 8.9 inch Kindle Fire HD tablet has a brilliant Front-facing HD camera for video calling and more. The tablet runs a standard battery which provides Over 10 hours of reading without any delay. Amazon 8.9 inch Kindle Fire HD tablet has Ambient light, accelerometer, gyroscope and digital compass sensors.